Weeks 1-4 are incorporated in the first 30 daily letters to enquirers. After the first 30 days, letter frequency reduces to a weekly email with hints and tips on your wedding at Craig y Nos Castle. These letters should hopefully be helpful to you whether you are considering Craig y Nos Castle for your wedding venue, or whether you have booked the Castle. They will continue to be sent to you until you unsubscribe from our mailing list. Once you unsubscribe we regard you as 'not interested' and cease all contact. If you inadvertently unsubscribe or miss any of our letters, you can find the weekly letters indexed below and the first 30 daily letters on are indexed here. (W10) Wedding toasts – who toasts what and whom, at the Wedding Breakfast, and in what order? (W12) Invitations accepted, so who on earth do you sit with who at your wedding breakfast? (W14) Ceremony Room – who built the Opera House and what makes it so unique and special for your wedding ceremony? (W15) Why did Patti Buy Craig y Nos Castle? When she could have chosen anywhere in the world, and anywhere with better weather! (W16) Who is that woman riding a chariot on the theatre curtain, and do I want this woman in my Wedding Photos? (W20) Should you use the Function Room for your Evening Party Room or remain in the Conservatory ‘wedding reception room’ day and night? (W25) Wedding Themes – can you theme your wedding based on where you and your partner hail from – is your home town on the list? (W26) Wedding Themes – What Colours will you choose for your wedding? (W27) Wedding Themes – weddings with dogs; can you invite your dog to be your ring-bearer? You may not have thought of the period between the Ceremony ending and the Wedding Banquet starting but it is a long gap, without food, maybe 2 – 3 hours! Most guests, if not staying the night before, will probably have got up early on the day to make it to the Castle in time for your wedding ceremony. They may not have had chance to have a full morning breakfast. Also, most guests will not have considered the Wedding Banquet timings. They won’t be aware of the Running Order of your day, the time required for photos etc., so it won’t have occurred to them they might get very hungry around 2 pm, yet have nothing to eat till 4pm or so. For on your wedding day, you will need a big gap – generally two hours – between the Ceremony ending and the Wedding Banquet starting. During this early afternoon period (when normally most people have their lunch) you will be chatting to your guests, they will be drinking at the bar and having their Welcome Drinks, and most importantly, you and your guests will be having your Wedding Photographs taken. Photographers need a lot of time and tend to over-run, so you should allow a good two hours between Ceremony ending and Wedding Breakfast starting. This means many wedding breakfasts will not start till around 4 pm or later, depending what time you have your Wedding Ceremony. A 4 pm ‘wedding breakfast’, for guests who may have skimped on their morning breakfast, and not had any lunch, is quite a gap without food. Some guests may even have health requirements that require them to eat something during the day. To solve the problem of hungry guests at ‘lunch time’ (typically 1 – 2 pm), it is recommended you provide some snacks along with the Wedding Drinks. Nothing too much, nothing too filling. You want everyone to enjoy their wedding breakfast so must not fill them up! The ideal arrangement is some canapes served with the welcome drinks, or welsh cakes, or at least ‘something’. You may have noticed the frequency of our Wedding Planning Tips emails has now decreased. In the first month we sent you a daily tip, and now we have moved to a weekly wedding planning tip. You can opt to continue receiving these Planning Tips as long as you like, or you can unsubscribe at any time by pressing the unsubscribe option at the bottom of this email. I will continue sending you regular tips until you no longer want them, irrespective of whether you have by now booked your wedding at Craig y Nos Castle, or are about to. Our wedding tips are both for Couples planning to book their wedding at the Castle and for existing bookings. This week we are taking a closer look at Wedding Breakfast Table Plans. This is something you will not be able to finalise until you have your RSVPs in and have a clear idea who is attending and indeed, what they are eating. However, you can start on some provisional table planning in advance of sending out the RSVPs, once you have an idea of who is coming to your wedding, as it makes sense to plan who is sitting next to whom well in advance. You may decide it would be nice for your guests to have some idea who they will be sat next to at your wedding, or you may prefer to keep this information to yourself. iv. who will want to catch up with who – putting together those who may not have seen each other for a long time. v.	The interests, careers, politics, religious affiliations, and any other elements of guests’ personalities and preferences may also merit some thought in the planning of table seating. vii. You may also want to separate some people who you feel will not get along with each other, and even keep some parties some distance away from each other on well separated tables! Our round tables are quite large and can seat up to 12 people, though at this number, some should be children as they will take up less space. You won’t have thought of this but if you have a number of rather portly guests, this might be a consideration when it comes to deciding how many will fit around the table. Also consider where in the room a more fully occupied table or a table of ‘the more generously proportioned’ goes. Have regard to the need for waitresses to get between the tables to serve meals, once they are full of seated guests. Also have regard to your own route, passing between the tables, to get to the Head Table, if you are to arrive after the majority of guests are seated. A normal number on a ‘round’ is 7 – 10 which should be placed centrally. Any larger occupied tables need more space around them. Lower numbers of 6 or less will make a table look a bit bare. The number of guests you plan to have at your wedding will determine the layout of the wedding banqueting room and how your tables will be set up. 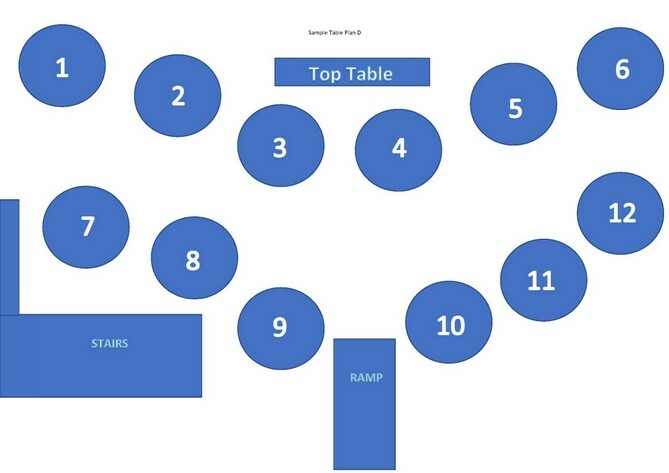 See a sample layout for 50-60 guests here and a table plan layout for 100 plus guests here. See advice on where the Head Table goes here. Most Couples will tend to organise the ‘essential’ suppliers without much ado. On occasion we have had someone forget a key supplier, including about four over the years who omitted to book the Registrar – so the Registrar should be on your Suppliers List! 1. Day time entertainment such as Harpist, Singer, Band playing in gardens, Pianist etc. 12. Verging on the essential due to gap between ceremony and wedding breakfast, either offer Canapes with Welcome Drinks or Cupcakes. Hopefully I have not missed anyone out. The ‘wish-list’ is a concept introduced to me by my General Manager. I set him a load of tasks to do at the Castle such as “build X number of new en-suites this year” and “replair the secret Bridal Suite roof” etc, and when various tasks do not get done for several years, he says, “Ah, what you meant, is this item is on your “wish list”, I can only do what we can afford to do on the essentials list”. So, like you, we have a budget for the castle which is restrictive. In an ideal world, if I was having a wedding, I would have a Table Magician for the children’s (and adults’) amusement, Dove Release because I know how superb it looks, and Casino Table hire if having a large wedding above 100 evening guests, because at that number you can afford to spread the guests around the building without leaving the dance floor empty and the casino does look very classy. A Table Magician is also excellent entertainment for the Tables – typically at gaps in the Wedding Breakfast or in the evening before the DJ starts playing. I would definitely opt for a band playing my favourite music on the lawn by the theatre in the summer, seating them under the ‘sail’ in the theatre garden. Or I would close the front courtyard to cars and put my band in the courtyard. If weather is fine, I would serve welcome drinks either on the lawn or in the courtyard. As the front courtyard is best left empty for wedding photographs and for guests, guests’ cars can be parked in the South Car Park instead. If I had a lot of children I would opt for a bouncy castle in the theatre garden, which on summer evenings can be used both before and after the wedding breakfast, though this is not a good idea for remaining smartly attired for photographs. A bouncing Bronco can also be added for the adults – again best on a summer’s evening in good weather. 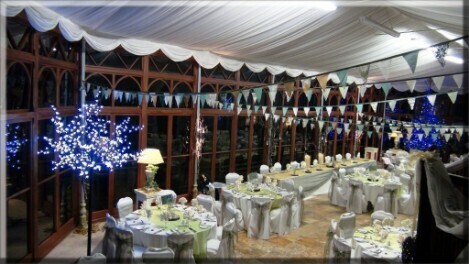 Bunting also looks very effective in the Conservatory, though it is a bore to put up, requiring tall ladders and is best left to the Castle to do for you (for a fee) as we do not want guests falling off ladders putting up Bunting. Balloons I personally would not go for, but that is just my personal preference, though if you decide to have a children’s room (Breakfast room has often been used for this purpose) Balloons may be an idea. Also, there are some very tasteful balloons that can be set up for weddings. Being of the older generation myself, a Toastmaster would be my preference, certainly this can work for a second marriage, but is less popular with the younger generation. Have a look through our index of wedding suppliers and decide who you must have, and book them, and then decide who you would really like to have, from your wish list, subject to budgetary limits. When you attend someone else’s wedding as a wedding guest, you will not have given much thought to the wedding day schedule. You arrive, you go to the ceremony, you relax afterwards and catch up with friends and relatives over some drinks. You are roped in for a few group wedding photographs, and eventually with some relief, as by now you are getting quite hungry, you are called through to sit down to the wedding breakfast. You are impressed by the table décor, views and the new banqueting room which you have not been allowed to see up to this point. You have a few speeches to sit through, so the wedding breakfast seems maybe quite long for you, but you have good company at your table and are happy to chat to friends and maybe get to know some new people. There’ll be a load of new family members merging with your known family circle, joining from the bride or groom’s side. With your own family and a new family joining together, a wedding becomes about getting to know everyone in the new enlarged / combined family. The evening party passes in a blur of chatting drinking, and partying and eventually you go to bed and that is that. You’ve had a nice day and are glad you came – but that is about as much as you will think about the ‘schedule of the day’ (as a guest of someone else’s wedding). When it is your own wedding, however, every element of the day’s schedule needs meticulous planning. You become aware there are a lot more distinct elements to the ‘running order’ of your wedding day than you first imagined. 1. Setting up of Banqueting room tables by suppliers, and establishing who will do what and when. You will have different suppliers all working together such as the table décor company, chair covers company, table centres company, yourselves, the venue’s own staff etc. It can get quite crowded as everyone beavers away setting up the Banqueting room according to your pre-set plan. 2. Ceremony timings including the procession and recession in the Wedding Ceremony itself. 3. Wedding Drinks – timing, location, what to serve. 4. Photographs – timing (allow 2 hours but tell photographer one hour – over-run needs to be built in. Tip: do not tell a photographer 2 hours or he will take longer. Important tip: choose a photographer familiar with the venue as they will be faster and more efficient at getting the best shots in the best locations for the weather conditions / time of day, location of best viewpoints and location of sun (if applicable) etc. 11. Someone to co-ordinate the set-up by suppliers (more on this next letter). 12. When will suppliers arrive, set-up, perform, and pack up or go? 13. DJ finish time and bar closing time? Further guidance can be found on our Wedding Day Schedule page for more general advice here and see our Running Order Planning for your wedding at Craig y Nos Castle here. In the days before your wedding you will want to confirm final arrangements with all your suppliers. Are they coming? When are they coming? What are they bringing – enough items for number of guests, tables etc. This process will be completed by you after you have had your event finalise meeting at the castle and have been sent a copy of your Running Order by the castle. See a sample of one running order wedding day schedule here and a second running order sample here. Ideally you will want to decorate the Banqueting room in part the day before your wedding. This however depends on what the wedding before yours is doing. Larger weddings will tend to vacate the day room around 7 pm and move through to the function room, giving you unofficial access to the Banqueting room around 9 pm the night before. This means arranging for the cleaners to go in, in the evening, and your wedding planner to set up the tables basic layout according to your table plan, ready for you or your suppliers to put the finishing touches to your tables. Decorating the wedding banqueting room is one of the most time-consuming aspects hence it is attractive and less stressful if you can arrange to do this the night before your wedding day. Bearing in mind the wedding before yours will have paid for a day’s exclusive use, you do need their co-operation which we will seek for you. 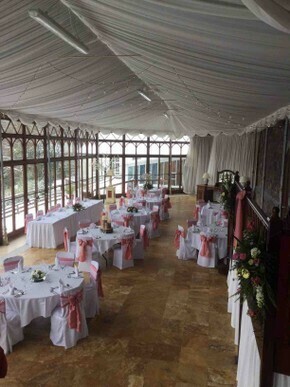 Smaller weddings however may opt to stay in the Conservatory day and night. This is because smaller weddings can look a bit lost in the main function room. So, if there is a small wedding before yours, you will not get access to the room on the evening before your wedding. You will need to liaise with table décor companies re the start time they can gain access to the venue, bearing in mind some of your suppliers may have other wedding clients at other venues on your wedding day. Another subject little thought of by wedding guests (who erroneously assume they can book straight into their rooms on arrival!) is where can guests get ready in time for the Ceremony? If there is a wedding before yours, or guests staying in the bedrooms before yours, the booking out time is 11 am for all B&B guests. It takes the cleaners a few hours to get around all the rooms cleaning them. Hence the ‘booking in’ time for the bedrooms is 3 pm. Early booking in can be arranged for £25/ room (limit of three rooms), but normally guests will get changed in the sports room and use the lockers there for any stored items before moving on to their rooms after the Ceremony, once they are ready. You will need to let guests know to use the sports room showers and lockers for changing in prior to the ceremony, if they wish to freshen up etc. Your photographer needs to arrive in time for the Ceremony. Your florist will need to know when they can have access to the theatre and the wedding banquet room. Your DJ will need to know when they can set up in the evening. They can set up any time if you are using the function room for the evening party, but will need to be given a specific time when you are anticipating finishing your wedding breakfast, if the evening do is to be held in the Conservatory instead of the function room. Your running order schedule (see samples above) may best be emailed to all Suppliers so they know when they need to arrive and when they can set up. See more on the set-up arrangements for wedding suppliers here. This can be more complicated than it first looks. First off, Toasts are separate from Wedding Speeches, yet may be combined with them. Toasts are normally done in a set order, while Speeches are done in a different order, so if combining the two, you will need to decide what order YOU want everything to happen in. See more on order of the wedding toasts here and more on the order of the wedding speeches here. Some weddings opt to have the speeches and toasts at staggered intervals through the wedding meal, which can make it helpful to have more than the two standard courses on our Wedding Breakfast. Consider adding a pudding course, or a cheese course or a coffee and biscuits ‘course’ at the end of the wedding breakfast if you are accommodating a lot of toasts and speeches. If combining speeches and toasts together, such as having each speech followed by the toast, note how a distinction needs to be made between the speech part (holding and drinking wine) and the toast part (holding champagne glass instead, ready to raise it for the end of the toast, but not drinking from it till the end of the toast). Where toasts are to be kept separate from the speeches, it may be appropriate to have all the toasts quickly dealt with in ten to 12 minutes or so before the first course of the Wedding Breakfast, and then the speeches after the main course, or the toasts after the first course, or staggered before and after, with the bulk of the speeches after the second and third course. See some useful advice on speeches and toasts here, but note how the order of things is very much down to the individual Wedding Couple. Also see our own wedding toasts and speeches wedding planner page here. Social media is a relatively recent phenomenon but it sure beats the phone and the old method of posting out RSVPs and wondering who is attending. However old traditions die hard, and sending out formal wedding invites, even though by the time you do this, you should KNOW who is attending, is still part of the whole array of traditional things you schedule to do in the run-up to your wedding. This is because receiving a formal RSVP from your guests in the post is a lot more sincere and committed than someone confirming their attendance via Facebook, text, email or What’s App! Even ‘Save the Date’ cards should not be dispensed with, even though you will, in the modern way of things, have already sent out your save the date notices via social media. It is part of the formal way of doing things and we have noticed when these formal traditional methods of communication, and invitation, are not followed, Wedding Couples do suffer rather more last-minute absences and cancellations. So have a look at the wedding day countdown for when to send out ‘printed save the date cards’ (18 months before wedding or as soon as you decide the date if short notice) and ‘formal wedding printed invites’ (3 months before the wedding). Obviously use social media to announce the date ASAP, but the formality of sending out ‘save the date’ cards, then later sending and getting RSVPs back in the post, increases commitment to attend. Note the wedding invites go out quite near the wedding itself, only three months before the wedding date. WITH the invites, you also send out your wedding breakfast menu. You choose two starters and two mains from either of the wedding menus on the standard wedding breakfast menu here, or you can choose some or all courses from either of the menus on the superior wedding breakfast menu here. You send out the menu with the RSVP invite cards, and ask your guests to specify their choice of meal on the RSVP. In your covering letter you make it clear that RSVP means they need to “Reply please!” as some may not know to do this, and to select their menu choice. On your RSVP invite letters, you specify by name all those in a family who are invited, so both husband and wife, partner, etc are mentioned by name and all children (if invited) are named also, under the adult’s names. If children are over 18, they should be sent separate invitations in their own right, though you may opt to include them with the parents’ names as their ‘children’, if you think this is better. You should also include a map to the venue, sat nav post code, notes on accommodation available and booking bedrooms, all of which can be printed on a separate ‘reception venue card’. Note that guests can stay the night before the wedding at half price, subject to B&B availability. Also of course, a menu for the wedding breakfast, meaning you will have chosen your two options for starters and mains and any other courses ahead of sending out your RSVPs. See tips on wedding invitations on our wedding planner guide here. See here for loads of stationery samples for wedding day invitations for professional printing of wedding invites, menus, save the date cards, reception venue cards, and more. 10. Table plan (not necessary till wedding day and normally comprising a board with the table plan and the names of guests to each table). 11. Gift lists – contrary to what any stationer tells you, these should NEVER be sent out with the RSVPs/ invites! 12. Thank you cards for thanking guests for their gifts (used of course, after Honeymoon). See Detailed Wedding Stationery advice here. Last week we talked about Wedding invitations and stationery. Let’s now assume you are sitting at your kitchen table, with armfuls of RSVP acceptances. How on earth do you decide who will get on with who at your wedding breakfast? 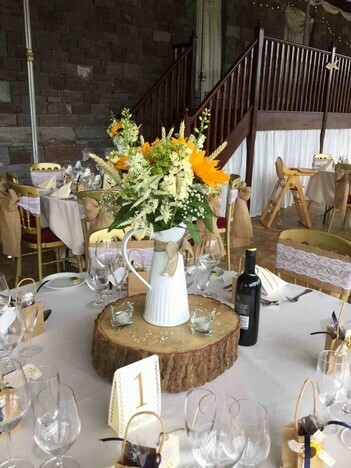 Chances are you have not given this much though yet, as it is now only three months on from when you booked your wedding viewing or made your enquiry at Craig y Nos Castle, and even if you have now booked your wedding date, the wedding itself may still be some way off. There’s an art to planning your table seating, as at any dinner party, so let’s look at some basic recommendations. 1. Start by writing out the names of all your guests on little hand-written place cards. You can then draw circles for each of your tables and place the circles in the approximate layout for your venue’s dining room table plan. 2. Position the names on each table, moving them around from table to table as necessary till you get the best match. This will be much easier as you won’t have to type up the table seating plan until you have it just right. 3. Decide which couples will sit together and which will prefer to mingle. 4. Any couples who are separated or divorced will need to be sat at different tables. 5. Children are best seated on tables around the edge of the room, in case they are a noisy distraction during the toasts and speeches. 6. Guests who are making speeches need to go on the Head Table, if close relatives, or a primary central table, so they are in the centre of room and can be heard. 7. Be careful about assuming you need to seat people next to people they already know – they will gravitate to each other outside the formality of the wedding breakfast anyway. Consider mixing the guests up a bit so they mingle more, but not to excess. It is often easier to seat people next to people they know, but where possible see if you can get the two new families to get to know each other more. 8. Match people of similar backgrounds, interests and ages. 9. Decide if you want to sit work colleagues together – this is generally considered wise, even if all they do is talk shop. They will be happier and it is not so easy (nor necessary) to get work colleagues to mingle with family members. Work colleagues tend to be a self-contained social unit. 10. Have even numbers of male and female at each table. 11. Have you a PA system for the speeches? If not, place older guests nearer the speakers so they can hear the speeches. 12. Have you enough high-chairs at the venue? When planning your menu have you fully considered guests’ dietary needs and will this affect seating plans? See more advice on seating arrangements at wedding breakfasts here. Your wedding ceremony will probably be held in the Castle’s Grade One Listed Opera House, which seats 150 but for wedding ceremonies, is licensed to seat 130. There are other options – smaller weddings can get married in the Breakfast Room or in the Summer House in the lower gardens. Most weddings will marry in the Theatre. The Theatre has a number of flexible alternatives. How you view it, how you see it on a viewing, is not necessarily how it will be on your wedding day, as you have a number of different options for the ceremony room’s layout. It is a stage, after all, so can be changed according to your preferences. 2. Some Couples do not want white chair covers. In this case you can have ‘bare’ chairs. With the covers off you will have blue velvet seated, silver painted Cheltenham Gilt chairs. 3. The carpet down the centre shows red on most pictures. We are buying a blue carpet also as the red one is faded. You can choose either a red or blue aisle carpet, according to your own wedding colour theme. 5. Two large Gold Thrones are a recent addition. These do look a bit garish in real life but are excellent in photos as they are not so 'bright' in a photo. How wedding photos come out in practice compared to what you really see in real life is worth noting - see picture above. You can choose to use the Gold Thrones or remove them for your own ceremony. Before deciding, check out some photos of them on line at other weddings, as they come up much better in wedding photos. 6. Ceiling uncovered or covered. In sunny weather we may have the ceiling covered, to prevent the sunlight flooding through the glass roof. Bright sun fades the 120-year-old wall paintings, and the carpet and chairs and is bad for old buildings. If you view the venue with the ceiling blacked out, it feels rather dark going in to the Ceremony room from the outside. We have even had wedding couples cite this as a reason NOT to book the venue, because they did not realise the ‘lantern roof’ can be uncovered letting loads of light in. The lantern roof is covered in the above photo. While this makes it initially a little dark for Guests coming in to the room from a bright sunny day outside, it is good for wedding photographs. The soft romantic ambience of the Ceremony Room is conveyed by the mellow glow of the wall-lighting and, as in the photograph above, a few candle-lights in glass containers along the aisle and on the stage. So, remember the opera house can be brightened up if you have the ceiling protective blackout cover removed, or dimmed with the cover on. If you definitely prefer it on or off, either preference will need to be advised to us at your Event Finalise meeting. 7. The Stage Curtain is of historical importance, having a painting of a woman on a chariot, much like Joan of Arc. It is actually a representation of the opera singer Adelina Patti, who built most of the castle, and who built the opera house too, but some Couples want a plainer background. The curtain can be raised out of sight, or the blue curtain can be brought down in front of it. In the above example, Patti has been obscured behind the arched white foliage. These white fluffy trees were a distinctive and imaginative theme that the Couple carried through to the Wedding Banquet. Smaller white trees adorned the tables creating tall centrepieces and a sense of being in a white canopied forest in the wedding reception room. 8. Alternatively, a free-standing white pleated screen can be hired (normally from a DJ company or a Décor company) and placed in front of the existing stage curtains, giving you a clean white pleated backdrop for your wedding ceremony. 9. While I have not seen many wedding couples do this, the stage can also be opened up to reveal the original backdrop at the back of the stage. 10. Floral displays are available from Centre of Attention and massively improve the stage. See examples on our Wedding Fairs page – scroll down to the February 2018 Open Day pictures. The Opera House is a historically unique building with excellent acoustics – it was designed by an opera singer so her voice could be heard clearly by her private guests. Your own guests will now benefit from the same excellent acoustics, and everyone should hear you clearly as you say your wedding vows. The Opera House was built by a world-famous Opera Singer, Adelina Patti, who chose to make Craig y Nos Castle her home. Adelina Patti was the highest paid opera singer of her time, probably of all time, earning £1,000 (£500,000 in today’s money) a performance. With a Matinee and Evening Performance on the same day she could (and did) earn £1m a day in today’s money. She insisted on being paid in cash or gold. She was the ‘Madonna’ of her day, singing privately for Queen Victoria for 25 years, travelling the World, and probably away 6 – 9 months of the year, during which time the castle kept being extended, altered and then altered again – see the changes in various old postcards of the Castle here. Patti had her own train carriage (like the Royal Family) and spent £100,000 of her own money (£50m in today’s money) forever extending and altering her castle. She employed up to 40 gardeners and some 40 household servants. And in 1891 she had her own private opera house built, so she could practice her opera singing and perform for honoured private guests. 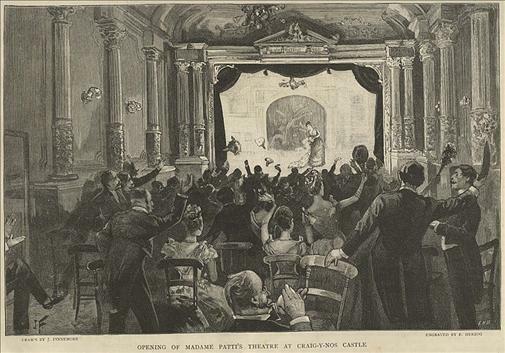 Here is a picture of the theatre on the Opening Night in 1891. When you get married in the Opera House on your wedding day, you will be stepping back 130 years in time, back to when the theatre was first built in 1891, for nothing in the theatre has been changed since Patti died in 1919. This is what makes the opera house unique. Most theatres remain in constant use, evolving over time as new performances are put on and new stage technology evolves. This never happened with the opera house at Craig y Nos Castle, because it was never intended for public performances. That is why even today it is not large enough for commercial opera, which needs around 450 – 550 seats to make it pay. The Patti theatre’s auditorium is not much bigger than the stage! At most it will seat 150, though Patti probably designed it for a much lower number of guests, with plenty of space for each guest to move around. The floor is also unique as it was one of the first, and the only surviving example, of a floor that can be altered from a raked (sloping) position, to a flat (ballroom) position. This was done so guests could watch her perform before dinner, then go through to the Conservatory perhaps to dine (just as you will for your wedding breakfast), before returning to the theatre with the floor raised flat, for ballroom dancing. Unlike today, Patti did not have a function room – as what is now the function room was then her sitting room and billiard room. Instead, she used the theatre for ballroom dancing after dinner, by having her servants raise the floor level during dinner. The opera house was also the first building in Wales to have private electricity. Early stage lighting was primitive gas and this is why theatres frequently burnt down. Spotlights used burning lime, hence the phrase “in the limelight” which originates from being in the spotlight on a stage in the olden days. On occasion Patti’s dress would catch fire on the gas uplighters at the front of the stage, and firemen had to be stationed in the wings to put her out. Fed up with the risk to life and limb, Patti had her opera house wired for electric light. See more on how electricity was first used in the opera house here. See more on the history of the opera house at Craig y Nos Castle here. As you discover more and more about the history of the Castle and its Opera House, you will really begin to appreciate why the Castle is such a unique venue for a wedding. Nothing else quite compares in terms of history and romance. (We haven’t even touched on why Patti bought it yet – that’s another very romantic, and scandalous, tale – more next week). We’ve started to look at the Castle’s history and if you have ever stayed at the Castle, you may have been on the Castle History tour (free to residents). In our regular letters we’ve talked a bit about the life of our famous previous owner, the world’s wealthiest and most famous Opera Singer, Adelina Patti. Adelina Patti bought the castle in 1878, for £3,500, and though she did once try to sell it, she lived here until she died in 1919. This means she lived here on and off for 41 years - most of her life. Much of this time she was touring the World, performing in Europe and America, but she was always happy to return to her ‘Home Sweet Home’. While she was away there would have been frenetic and constant building activity and alterations, which has resulted in some rather higgledy piggledy aspects to the Castle today. Edward VII visited the castle when he was Prince of Wales, possibly more than once. One story relates to a time when his train was delayed and the party arrived late at night. The servants awoke to the sound of unknown visitors and Madam Patti shooed them back to bed before receiving her guests personally. On the following day, the staff saw the Prince and realised why their Lady was not abed on the previous night. Adelina Patti was married three times. Like Henry VIII who had six wives, Patti had 3 husbands: divorced – died – survived. The love of her life was Husband 2, Nicolini. Before they married, Nicolini was playing Romeo to her Juliet. Her then first husband (the Marquis de Caux), watching the performance, observed his wife kissing her Romeo 14 times more than the Libretto required. Suspecting something was afoot, Caux split from Patti, though it took a while for them to officially separate. In the interim, Patti bought and moved to the Castle with her lover, Nicolini. We now know this was some years before she divorced her first husband. This explains why Patti chose to buy somewhere so remote and isolated, as the original house in the Upper Swansea Valley then was. There were no proper roads to the house (it was not yet a castle) and the railway line was up a mountain, also with no road to it (she later built her own station waiting room at Penwyllt, plus the road to it for her horse and carriage). She wanted to get out of the public’s prying eye and have some privacy. Patti was Catholic and divorce was not permitted. Having an affair with and then living with another man while still married to her first husband would have been quite scandalous, had it been widely known. She bought the castle in 1878, and lived discreetly in what must then have been a remote mountainous area of Wales, where no one in the wider world quite knew what was going on. Unlike Henry VIII, who had to change the religion of the country to secure his divorce, Patti – as a world-famous Opera Diva – knew the Pope personally. Hence the Pope allowed that her first marriage could be annulled. 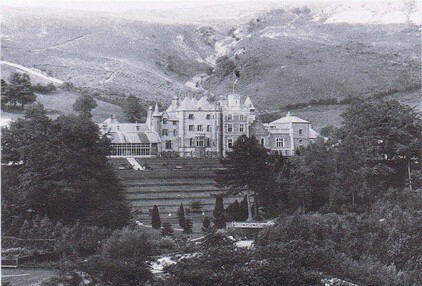 Patti and the Marquis de Caux officially separated in 1885, seven years after she moved in with Nicolini at Craig y Nos. The divorce cost her £64,000 (over £30 million in today’s money). She quickly recovered financially - as one does, when earning £1m a day. The woman is of course, Adelina Patti, the opera singer who built the Theatre in 1891, and who lived in Craig y Nos Castle for over 40 years, blowing £50m in today’s money on extensions and improvements, building her own palatial retreat. Craig y Nos was in her day a remote mountainous idyll in South Wales (no roads, no M4 Bridge etc, in those days). Of course you do not need to have Patti as your backdrop. She can be whisked up and away with a few turns of the 130-yr. old curtain winch. In her place you can have a plain blue stage curtain, a pleated white backdrop from a wedding supplier, or any other backdrop of your choosing. Most Couples though prefer to maintain a connection with the history of the castle, and Adelina Patti is certainly a major historical figure, although hardly anyone these days knows of her. The highest paid opera singer in the World – ever – and able to earn £1m a day in today’s money, she was the Madonna of her day. 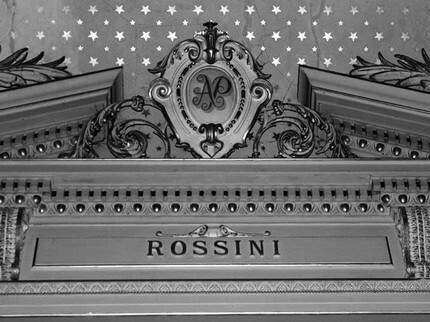 The composer Rossini, whom she admired so much that she demanded to be buried next to him in Paris (Patti was duly shipped out to join Rossini – only for Rossini to up sticks and move from his mausoleum in Paris to Italy at the behest of the Italian Government), initially viewed Patti not so much as a professional but more as a popular singer. Patti was determined to prove Rossini wrong, and in representing herself on the Stage Curtain in her role as Semiramide, in Rossini’s highly acclaimed and highly complex last Italian Opera – so complex that few opera singers wanted to perform in it as they feared they could not do it justice – Patti was making a point, a statement. She was saying she had ‘arrived’; in her role as Semiramide, she was demonstrating her art, marking her entry into the world of opera as a true professional, not merely some high earning pop artist of the day. Who was she performing for? Whose name appears above her in the centre of the proscenium - with her own logo framing his name? As you now know a bit about the history of the woman on the chariot behind you, as you take your wedding vows, perhaps you’ll feel more assured about letting her look benignly upon you as you in turn enter the next major stage of your own life, with your new partner. But if not, a pleated white screen will hide the past, as you embark upon your own future. 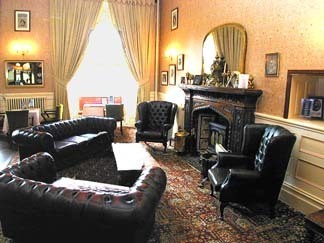 The Nicolini room, so called because it was the office and library for second Husband, Nicolini, is now a warm sitting room with log burning fire, loads of leather chesterfields, and some nice antique furniture. It is also used as the Welcome Drinks lounge, as it is the first room guests come to on walking up the stairs to Reception. It is a lovely warm room in winter while in summer it benefits from lovely views over the Tawe to the opposite mountain. In the evening this room can be used for your Casino Tables. For larger weddings able to spread around the castle without diminishing the number on the dance floor in the function room, the Nicolini can be turned into a games room, with board games, a children’s room complete with entertainer for the children, or a casino for the adults. By day, your harpist or small live bands, any live music, can be playing in this room, if the weather is bad, while on sunny summers days, having your hired musicians playing out in the garden or courtyard works very well. Post Boxes, Menu Table Plans, Candy Cart supplier, (we now have our own candy cart as well) and various decorative support items including signage and notices can also be placed in this room. Attractive Canapes Displays can also be set up here, alongside your welcome drinks. For many years the Nicolini Room was a rather drab, green painted room, with a HUGE long bar in it, which was never used. The original Nicolini Room bar was larger than the main bar, just in the wrong place. There was a lovely ceiling of cantilevered square sections, which sadly we had to lose, when we found it was all about to fall down. Because the room had fallen into disuse as a bar, and yet was right by reception, we realised we really needed a reception lounge – every hotel has one, yet we did not. There was no fireplace in the room, just the bar, a pool table, and some upright chairs and small round tables. It was not a friendly room. It was not insulated, so was always very cold. I decided we should take the bar out, or maybe make it smaller, and give it a lick of paint, and put some comfortable armchairs in it. A two-week makeover was planned. Like a lot of things at the castle, when you take a look behind the façade, things are even worse than they look on the surface. As chunks of ceiling fell down when we tried to paint it, we pulled away a section that was falling down intending to replace it and realised the ceiling joists were all quite rotten. This was from decades of water ingress. On taking over the castle in October 2000, I’d found virtually EVERY room leaked, and anywhere with gullies was the worst affected as the lead gullies had all failed. This meant water was pouring in. 160 individual buckets and plastic containers were needed in the upper derelict levels, to collect the water. It took a groundsman several hours on rainy days just emptying the buckets. It was a joke, but did not particularly bother me at the time. I was more intrigued than concerned – I’d never seen icicles inside a house before, but the second floor of Craig y Nos was full of them in winter. When I first came to the castle, the main building was leaking so badly that on the 2nd floor we had waterfalls on the internal walls, streaming water flowing down all the walls in one upper room two levels above the Nicolini room. In winter this flowing water would freeze, creating icicles inside the rooms and sheets of ice down the walls. One of our first tasks was to repair the lead gullies between the 170 yr. old ‘pyramids’ at the top of the castle. This took half a year one summer, cost about £170,000, circa 2001 or 2002. It was not until we had restored the Conservatory in 2007, that we decided to give the Nicolini room a quick make-over. This ended up being over a year’s work, in winter 2008/9, as we found all that water from the ‘pyramids’ had penetrated all the way down through centre of main building, rotting every single ceiling and floor joist. 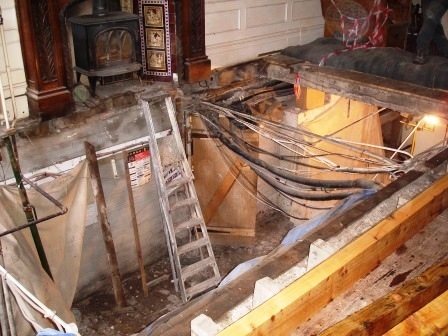 We found only two joists holding up the Nicolini room ceiling, and the floor was in danger of disappearing into the cellar. We ended up replacing the entire ceiling and all the floor, gutting the whole room, and starting again. See more on the Nicolini Room restoration here. Sadly, we lost the original ceiling and the bar. Part of the original bar’s mahogany surface is now the reception desk’s surface, so a little ‘recycling’ took place. Most of the historical ceiling was powder, and riddled with rot and woodworm. We have ended up with a nice cosy room. We found a functioning chimney and fireplace behind the bar, so put in a new Clearview log burner. All the walls were properly insulated with modern fireproof insulation foam, so what was a cold uninviting room is now always a warm and friendly reception room. The Nicolini Lounge is back to being what it was, a reception room for arriving guests, as it was in Patti’s day, though after a few years it became Nicolini’s office and library. One curious anomaly we uncovered, and left uncovered, was the double stone arch. This had been hidden behind a rotten wooden shelf. Notice how there is an ‘arch within an arch’. We also found the original stone mason’s lovely arches had been hacked away (in Patti’s time) at both sides (see the vertical straight lines either side of the arch). This was done to fit two substantial ‘double’ oak panelled doors. We know this because we found one of the original doors rotting in a leaking outbuilding (not salvageable). So even though the entrance into the neighbouring breakfast room is and presumably was always a narrow single door width (though even this is in doubt), Patti had fitted two very substantial oak doors here, to give the impression of a grander entrance leading into a much larger room than the small breakfast room. Yet in reality, one side was a solid stone wall, so the huge oak doors were for show only. 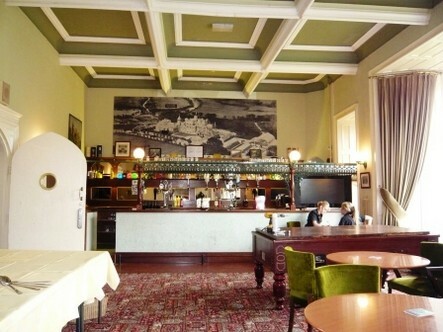 Last week we talked about the restoration of the Nicolini Lounge, now the Welcome Drinks lounge for wedding breakfasts. We mentioned how the ceiling and floor was completely stripped out and replaced anew. Patti had at one point a million pounds worth of personal Jewellery, so you’d expect her to drop the odd piece between the floorboards of the original building. Yet so far, despite replacing the floors and ceilings throughout the oldest part of the house, we have found nothing. Just one piece would be handy now! Ah well, we’ll just have to keep hosting weddings. Little do Wedding Couples realise how they are joining in the History of Craig y Nos Castle, as little by little, every penny that is earned through holding weddings and events, contributes to the slow restoration and preservation of a piece Welsh History whose significance and importance is only now being appreciated – as we tell the story of Craig y Nos’s past. When you choose to get married in any historic building, you become a small part of the story, just as we are. Let’s take a step back, 120 years, to the gentler times of Nicolini and Patti. Look at the Nicolini’s study in this old picture of the Nicolini Room here. No technology, not even a telephone, just books, desks, and curtains rather similar to what we have now. Note the view through the windows is partly obscured by a large vase on a stand, though the desk overlooks the view. We know Nicolini loved his wife, and in pride of place, there’s a picture of Patti above the fireplace. Read more of Nicolini’s story here. See the Nicolini room as it is now, here. The Evening Function room seats 150 banquet style and can take 180 or so, if the evening guests are for the bulk of the evening split over the Function Room, Patti Bar and Nicolini sitting room. We rather encourage the use of the function room for all evening guests as it concentrated the noise from a late-night party away from the bedrooms. However smaller weddings prefer to have their day and evening in the Conservatory Wedding Breakfast room, rather than have too small a party in the larger main rooms. The best arrangement is for the Evening Party room to be set up by the DJ while you are having your wedding breakfast in the Conservatory. Then when you have finished your wedding banquet and speeches, you and your guests can all go through to the separate evening function room for the disco, with everything already made up. 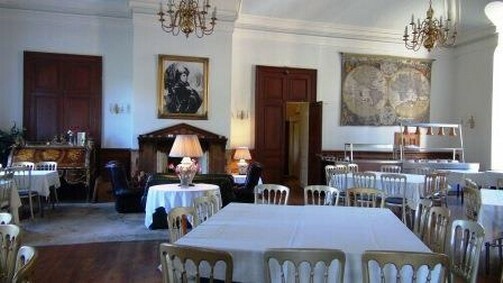 The Disco is normally set up in the far room (known as the Music Room – see historical picture here) with the dance floor being the whole of that room. The room today is little changed from how it was 120 years ago. The larger vaulted ceiling room is where your guests sit at tables and watch the dancing. This half of the function room is known as the Billiard room – see historical picture of the Billiard room complete with Billiard table here. If you want to use the Function room for your evening do, DJ and Buffet, you’ll need to have at least 75 guests having the evening buffet, under our new Midweek Wedding Package, to qualify for free exclusive use of the evening party room. Exclusive of the Function room is included on our larger weekend wedding packages - the Friday and Saturday Special Weekend Wedding Package and the Members Wedding Package. Before one of our chefs declined to feed everyone at a New Year’s Eve Party circa 2010/11 (he ran out of food and the fled the premises – I pointed my finger and said he had to go, it was an Alan Sugar Moment) we used to have very well attended New Years’ Eve Parties, well above 150 revellers, and a full house in the Hotel accommodation. Medieval Banquets were particularly popular, so we would have the same format every year – fancy dress in Medieval costumes, food meat and cheese etc served on wooden platters with no cutlery (just knives), simple. On one occasion quite early on – 2004, we had so many diners (260 in total spread over two rooms) that we realised we would never get the waitresses between the tables once everyone was in and seated. There were 220 diners in the main function room that night, for a room that can really only seat 150 (banquet style), and 40 in a room underneath (the old Blue Bar in the cellars). I decided it would be easier to get the food out on the tables first, then let the customers in. The only problem with this plan was the sheer numbers of people trying to fit in the remaining rooms. The Patti Bar must have had 90 standing, with another 100 or so (there was no restored Conservatory back then), queueing along the corridors, filling up the Nicolini lounge, and probably another 70 plus stuck outside in the courtyard unable to get in at all. As the building started vibrating rhythmically in a manner I had never felt before or since, I sensed the danger and realised we could have something go a bit pear-shaped. Ignoring the protests of the rushing waitresses and cooks streaming in and out of the kitchen, I slammed the kitchen doors closed, to the sound of platters of food crashing on the floor the other side and ignoring the howls of protest, flattened myself against the kitchen doors so no one could get in the way, swung open the adjacent double doors to the main function room, and shouted as loud as I could to be heard above the singing and stomping, GET IN NOW! The stamping stopped, the castle stopped shaking, and everyone filed meekly in, blissfully unaware of what might have happened. It was still quiet in the winter months in those days, so we could afford to close the castle to all guests for January and February for major internal works. We’d noticed the then carpeted floor sagging in places by the windows going down to the theatre. As we lifted up the floor boards, we found most of the joists connecting with the damp external walls had fallen away from the stone, the thick timbers having rotted so much they were powder. We found virtually every joist riddled with wet rot, dry rot, or gone beyond any definable form of rot into a sawdusty powder. We realised that had that rhythmical stamping of feed continued much longer, there was a very real risk some could have ended up in the cellars. Having seen the state of the floor in the function room, supports were put in strategic places and we proceeded systematically to take up every section of the floor in the Function Room in one year, in the Patti Bar in another winter period, and then in another year, the Nicolini Lounge. You can see some of the restoration work on the function room floor here. We even found the kitchen floor needed more than a quick make-over. We’d intended to put a new non-slip washable floor in the kitchen but on checking, had to replace every joist. Not all were gone, but every one was replaced for thoroughness. The same occurred in the reception room, all major work completed over a few winters, when we closed completely to do these works. Few would ever know how much major structural work has gone on at the Castle, without which, by now, had it been left unattended and unused, the doors to this historic building would probably have been boarded up with ‘no entry’ signs all over it. At least you know now, as you dance in the newly painted function room, you are on firm ground. Last week we looked at the restoration work on the ground floor of the castle, where every floorboard and every joist had to be systematically taken up and replaced. This week we’re going to look at the room you may use for your evening party, to see what it was like 120 years ago, when the Castle was a private house owned by the opera singer Adelina Patti. What we now call the Evening Party room was in fact three separate rooms. The Patti Bar as shown here and the Nicolini Lounge 100 or more years ago is seen in the second picture. We believe the first picture is the Patti bar because you can see the ceiling coving is similar. You can also see the exact same design of double doors leading through into the Billiard Room on the right corner of this first picture. They may even BE the same doors as we have today. They’re certainly the exact same design. The wooden wall panelling is also similar. Missing of course, are the doors to the current commercial kitchen. It is apparent the room that we now believe to be the Patti Bar as it was 120 years ago, was used as a dining room. We know the Morgans used the cellars for their kitchen, and it is possible Patti used the cellars also for her kitchen, or certainly for food storage. The kitchen used for cooking may even have been where the current commercial kitchen is. The main function room was divided initially into two separate but adjoining rooms. The Billiard room as it was in circa 1890 shown here. It has the same vaulted ceiling, painted or wall papered with a distinctive pattern of small circles in 1890. The music box (an Orchestrion) was huge, almost as tall as this 2-3 storey room. The ceiling cornicing is exactly as it is today, though more intricately painted then than now. You can just make out the wooden doors on the left that go to the Patti Bar, but the absence of any doors leading to the theatre, indicates this picture predates the building of the opera house (completed in 1891). The second room, overlooking the Patio and Country Park, was Patti’s private drawing room. We call it the Music Room. This room will be your dance floor if you are having your evening party in the main function room and bar, and is where the DJ sets up. As you study these pictures, you can get a feel for how the house would have functioned. Patti and her selected guests would have dined in her dining room, and after dinner the men would have withdrawn to the Billiard room for smoking and for a game of Billiards, while the ladies would have withdrawn to the Music room / Drawing Room for their own genteel conversations. While these rooms are large by comparison to how most of us live these days, in overpriced undersized ‘rabbit hutch’ homes which seem to grow ever smaller with every new-build, they are perhaps rather modest for someone able to earn up to £1m a day in today’s money. Patti referred to Craig y Nos Castle as her ‘Home Sweet Home’, and while the castle has an impressive wide façade as you enter the main courtyard, it is actually rather smaller inside than first impressions of the outside suggest. This is because the castle is actually rather narrow, from front to back. Craig y Nos Castle is really a long thin building, perched on a slope, with no space to grow ‘deeper', from front to back. Patti’s desire to expand was constrained by the space on the hill, so she had to expand sideways – North to build the theatre, and South to build the Winter Gardens (see 4th postcard down, the glass domed building on right of the main building). I reckon though she had the money to make a grander building, and certainly set about making it look impressive, she was happy to live in a more ‘homely’ internal space, as suggested in these old pictures. As function rooms devoid of much furniture, they are a reasonable size and will comfortably house 150 – 200 guests for a large evening wedding party, but in Patti’s day, they were rather cosy, delightfully cluttered, homely living rooms. Last week we looked at the past of the Billiard Room, Patti bar and Music room – now used as the evening function rooms. Until 2007 the function room was also used for all our wedding banquets, but since 2008, the former derelict conservatory has become the most popular room for the Wedding Breakfast. It is now a fabulous room with stunning views of the Brecon Beacons National Park seen through (recreated) Victorian style windows. But it was not always so. Though it is now 12 years ago, I clearly remember standing inside the leaking derelict Conservatory in 2006, water seeping through my shoes, as I was in an inch of water, looking out over a pile of rubbish. You could not really see through the green-with-algae, rotten 1950’s hospital era windows. I did feel it was rather a waste of a large space, but had put off doing anything about it for a few years. The prompt to do something about it came after I bought a hot tub at the Royal Welsh show in Builth Wells and had nowhere to put it. I needed somewhere to put it, so at a cost of some £150,000, restored an adjoining building, which became the sports room and spa. But then the outlook from the hot tub over the derelict conservatory needed to be improved. I did think of simply walling off the conservatory, so it could not be seen from the hot tub, but then decided I might as well carry on and renovate that as well. The work took about a year and was expensive. 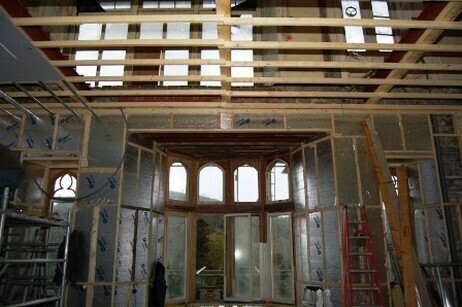 The windows alone were completely replaced, at a cost of £23,000 just for the frames. The decision to buy that hot tub cost me over £300,000. But we do now have a nice sports room and conservatory. Without the Conservatory Wedding Breakfast Room we would not be hosting 110 weddings a year. My hot tub was a good investment after all; it was the catalyst for major and necessary restoration work. Ironically the hot tub’s motherboard gave up the ghost in 2017. We found the manufacturer had gone bust, so cannot source a replacement. I don’t feel encouraged to buy another hot tub right now when all it needs is a motherboard! The hospital windows stretched along the lower half of the original Victorian windows overlooking the Country Park. The hospital had substantially replaced the original Patti era windows, but there was enough left of the originals along the upper sections, including some coloured triangular glass panes. Assisted by photos of the original building, we had enough data to replicate the windows pretty much as they would have been in Patti’s day. You can see the frames being delivered and laid out in the rear car park ready for the glazier in one of the photos from the Conservatory Restoration – see top of page. A local (but he was in fact Irish) roofer replaced the roofing felt used by a previous owner with a fibreglass roof, which leaked continuously over several years, almost as badly as before. The chap ‘guaranteed’ his work, but when called upon to honour his guarantee, stood with me under the dripping roof and solemnly declared it was ‘condensation’. I asked, how come we only ever got ‘condensation’ when it rained? I was reminded of Basil Fawlty and his builder in that new hall doorway scene. We tried repainting the new covering with a special paint to seal it, which worked for a year before needing redoing. After several years of this, in 2017 we paid another company to coat it with a rubber 'firestone' membrane and it has remained dry inside since. No more 'condensation' dripping from the roof. 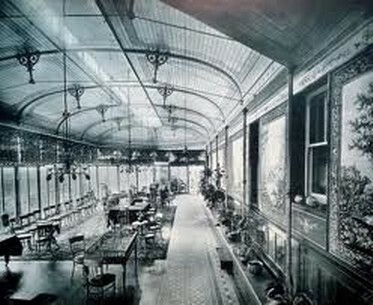 See Old pictures of the Conservatory inside in Patti’s day here. See Conservatory in hospital era, as a Children’s TB ward here, and patients having fresh air outside on the terrace here. See original pictures of the outside here, noting the original design of the windows. See Conservatory Restoration (2007) here. See New pictures of the Conservatory wedding banquet room here. Patti kept changing her mind about what to do with the castle. Where an ordinary person would employ an architect and present drawings to a planning authority, and then build according to the plans, Patti was no ordinary person. And there were probably no planning authorities in 1878 to bother her either. So rather than draw a plan and stick to it, she was throwing up buildings somewhat haphazardly, knocking them down and starting again. This process of evolution was expensive – she spent £100,000 of her money (£50m today) continually extending and changing the castle. This work would mostly have been done when she was absent, I expect, as she was travelling the world performing for at least 6 months of the year, most years. Had she designed and stuck to one idea, it would have cost her a fraction of her £100k. It is a shame we have so few photos of the original castle, and it takes a little thought to date them reasonably accurately, based on what little we now know of what was built when. When we look at the old pictures – and there are very few – we have to differentiate between early sketches and later photos. A sketch artist when commissioned to paint or draw a grand house, in the era before Photography became more commonly used, would generally exaggerate the dimensions and impressiveness of a room. This was because the sketch artist wanted to compliment the owner and get a repeat commission. Consequently, we can never say if an old sketch is accurate. Fortunately, we do have a number of old photos and as there are not many ground floor rooms, it is relatively easy to see which room is which. The Nicolini lounge now is clearly similar to Nicolini’s study then. The Music room now is clearly the same as the old picture of Patti’s drawing room here. The Billiard room which is now part of the function room, is unmistakeably the old billiard room here. One exception to this was the Patti Bar. We had one photo that we could not quite place, and it was only recently that we realised for certain that it was indeed an old picture of the Patti Bar in circa 1880-1885. As it was Adelina Patti’s dining room we suspected it was on the ground floor, and the Patti Bar was the only ground floor room left that this could be. What had puzzled us was that the ceiling cornicing is different in the picture above to how the Patti Bar looks now, so we were not sure we had the right picture. Only recently I realised Patti must have rebuilt the ceiling of this room. Originally, she had built a 2-storey extension, known as the North Wing, and the old Patti Bar picture we have is the room on the ground floor of this extension. Patti had a grander vision and didn’t like having just two storeys on her extension. At some point she had a vision for a castle. We guess Patti pretty well razed her extension to the ground, and started again, adding the third level, the turrets and castellations, around which time she renamed the property Craig y Nos Castle. Craig y Nos means ‘rock of the night’ - referencing the large rocky outcrop below Penwyllt that the castle stands in front of. The second floor with turrets and castellations required reinforcement and a rebuilding of the extension which previously had been designed as a 2-storey structure. A heavy iron frame ‘skeleton’ was used, which as sections of the ceiling in the derelict upper levels fall down, we can see today. See the different roof lines externally in the old post cards here, where the original 2 storey pitched roof changes into a 3 storey extension with castellations. Compare the first and third postcards’ roof line with the second and fourth postcards. So, what is the significance of all this, you may ask? Well, it means that now, as a guest dining in the Patti Bar while staying for a B&B stay, or as you sit down with a snack at the bar, we can now confirm you are indeed dining in Patti’s former dining room. You are probably seated in much the same area of the room where Patti herself once dined, and where she and her guests would have had their formal dinners, a century and a half ago. When you sit down to consider your colour theme and table décor, have you in mind any particular theme for your wedding. We’ve noticed a number of weddings base their wedding theme on where the Couple or their families come from. One wedding was themed on London Underground stations, which were used for the table names. Another on bridges in their home area and another on famous landmarks, while mountains and hills have also featured. This prompted us to come up with a ‘wedding themes by town’ list on our wedding site. 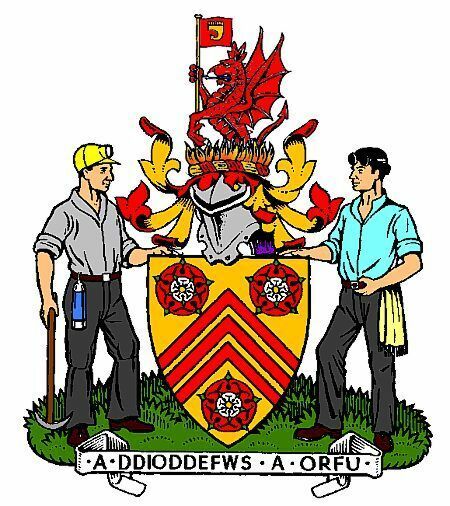 This took some time to write as it required historical and geographical landmarks research on a number of major towns / areas in Wales and England. If you fancy basing your own wedding theme on some element of your home town, check to see if your town is listed. The main towns in England are London, Birmingham, Bristol, and Reading, though there are more. Have a look to see if your home town is featured, just in case your home town gives you some ideas for your own wedding theme. Next week we will look at wedding theme colours. Colour fashions change all the time and there are myriad different shades. Any chair cover company will advise you which styles are fashionable now, as they are continually changing their bows and sashes to meet the latest trends. We have not updated our own wedding photos for a while so some of the colours below may not be quite the shade you would choose now. Fashions aside, you should still find the links below useful to go directly to a table setting in your specific colours. Multi-coloured – find them on this page – if you cannot make your mind up, have a rainbow! Craig y Nos Castle is a dog friendly B&B. Mid-week we encourage 2–5 day stays, with discounted midweek breaks Sunday to Thursday. We have carved out quite a niche as the most ‘dog friendly B&B’ in Wales. Every dog comes free, and has their own breakfast biscuit or sausage. Comfortable beds are provided for dogs and guests. Off the lead dog walks and comfort areas are conveniently situated outside a short walk from each ground floor room. Our dog friendly website comes high up in Google and brings in plenty of dogs and their owners, when we do not have a wedding on. This has encouraged some of our Dog Friendly B&B guests to get married here, with their dogs, and for Couples who have dogs, to decide to feature their dog in their wedding ceremony. With a little training you may even entrust your rings to your dog, as ring bearer, just so long as they do not run off with them! 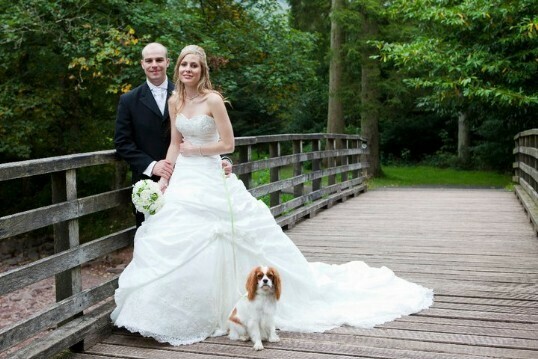 See our Dog Friendly Weddings Page here for ideas and stories from other Couples who have married with the help of their favourite companion. Our Open Days are held 3 times a year, typically in January / February, then again in April or May, and a third one in October. The Open Days are not like Wedding Fairs, which you visit to see the Suppliers and finalise arrangements with any you have already booked who are present at the Fair. An Open Day is designed to showcase the venue. You will be able to see the venue as it might look for a wedding. An Open Day is also an opportunity to discuss things with our two recommended primary wedding suppliers – we only have two present as they are needed for the décor of the venue. Centre of Attention based in Brecon will be decorating the tables and you can see some samples of their work at previous open days on the Open Day and Wedding Fairs page. In addition, our recommended DJ, Pure Weddings, will be present. He will set up his kit in the function room exactly as everything will look at your wedding (if you book him). Pure Weddings DJ also DJs under our Special Wedding Evening Entertainment Package (SWEEP) which you can book as an add-on, if having above 75 guests to your evening buffet. You can book one of his other packages if you do not qualify for SWEEP. At an Open Day you will be part of a large crowd of Couples some of whom will be booked brides and a lot of whom will be prospective brides, so there will not be time to hold an Event Finalise meeting to discuss your wedding specifically. So if you are traveling from afar and would like to meet a Wedding Planner to discuss your wedding, we suggest you make a weekend of it (subject to B&B availability here) and then book a separate appointment the day before or the day after, to see a wedding planner. A list of our wedding planners can be found here. It is now 8 months or longer since you first enquired about getting married at Craig y Nos Castle, which means that your wedding should not be too far off now. One thing that you will soon be arranging is your Event Finalise meeting, and deciding your Running Order of the Day. The event finalise meeting takes place about a month before your wedding date, and comes after you have had your RSVPs returned, with the choice of courses for wedding breakfast all agreed by your guests. When you set your Running Order you will of course know by now to check everything planned against the Schedule of the Day on our website here. There is one area where timings can consistently go wrong, and that is with Wedding Photography. Guests will tend to wander off and around the place, during and after your welcome drinks, which is the time you need them around for the group photos. You’ll need a good Best Man, or a Toastmaster, or some reliable guests to help round them up for you, for group photographs. Wedding Photographers need at least two hours, probably more if the weather is good and you are able to make full use of the grounds, rather than the one hour you might think is sufficient. Photographers may be delayed both by guests wandering off, and by their own wandering off. We have had photographers and brides go down to the Country Park for an hour or more, under-estimating the distances or simply enjoying the relaxing walk in the Park, happily getting a bit lost. We’ve often had to send out our wedding planner on a hunt for the bride and bridesmaids, running late for their own Wedding Breakfast (with guests getting hungry). Photographers who lead Brides astray around the 40 acres of park and lakes are not so popular with the kitchens. We recommend a number of good local Wedding Photographers here; they’ll know the building and grounds well. Do not let your wedding breakfast get spoilt by delaying the planned start time for the wedding banquet. Allow plenty of time for the Photographs. If you are having a videographer as well, the timings allowed for photography need extending. You do not want a photographer photographing close up shots of Bride and Groom while the Videographer is filming. We have seen ‘competition’ between an evening photographer and a videographer, with one photographer bumbling into view of the videographer and photo-bombing the video of the First Dance. If you use a photographer and a videographer, professional co-operation (and more time allowed) is essential. Check also they have both worked together before. Local Videographers on our list probably have, but check they do know each other and can work together. The Wedding Photographer has priority after the Ceremony for the still shots and group shots. This is his time of the day, when ‘the Photographer is King’ and all must co-operate and obey his command, so he can get the best shots for you. He knows what he needs and he has to demand he gets what he needs (everyone in the picture!) in order to do his job well. A videographer should have priority if videoing speeches and the evenings romantic ‘first dance’. The video should not be interfered with by any Supplier moving around within shot, nor by any staff getting in the way and inadvertently ‘photo-bombing’ the film. Note there is evening videography provided free of charge – but not guaranteed – under our Special Evening Entertainment Package. We currently hold 110 weddings a year at Craig y Nos, and would hold more if we did not limit our bookings to one wedding a day. You will by now be aware of the history of the castle but just in case you want to show any relatives some of the Old Pictures – here they all are. We do offer History Tours for all residents, though this is not generally done for wedding guests. It seems, unlike our Dog Friendly B&B guests who all go on our tours, and who come back for repeat stays, a guest of a wedding tends to come once and lacks the same affinity for the place that you have. If you agree this is a shame, and you would like your guests to benefit from some of the history of the place, all residents are entitled to a Free History tour. To arrange this, please let us know in advance, and find out how many of your guests would like to go on a tour. Your guests may be a bit the worse for wear the morning after, but this is something you could arrange for them if you feel guests would be interested. If you are encouraging guests to stay a couple of nights, this is something you could have scheduled in for the night before the wedding, again, free of charge. Please book this in advance as we have to rota a tour guide on. Large numbers will not be taken up to the derelict area, but below 10 or so, we can take you everywhere. Alternatively, and for a few weddings this has been selected, a ghost tour (max 15) the night before the wedding can be provided for a separate fee payable to the ghost tour company. Details of our Share the Experience tour are shown here. This is not for everyone, but can be made more light-hearted depending on the group dynamic. People do need to be sober for these tours, due to wandering around in the dark in the cellars and upper derelict levels. This is another way of picking up on the history of the Castle. This letter is the last in our sequence of 25 weekly letters, which in turn followed on from 30 daily letters in your first month of enquiry. You will continue to receive a monthly wedding planning letter if / once you have booked your wedding. Should you wish to look back over any of the subjects covered, please refer the index on this page and also to our Wedding Enquirers Letters index here. We have a castle specific wedding planner guide on the wedding site which is regularly updated and should answer most of your questions. There is a more general wedding planner guide which starts here. Of all the pages, checking you have included all necessary and wished for suppliers is an idea, while there is a useful reminder of everything you need to prepare for here – well, hopefully everything! An accommodation guide starts here and continues on various pages linked to the first. All that remains is for me to wish you every happiness on your future together, and we look forward to making your wedding day everything you could wish it to be, your perfect day!